I don’t tend to publish fiction online these days because – well – I’m a full time writer (on a part-time wage) and feel that there is still some value in the printed word. 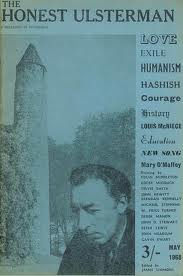 I’m more than happy to make an exception for The Honest Ulstersman though, a publication with a rich and colourful history, and which has recently re-launched in the digital world with Darran Anderson at the helm. I’ve contributed a new short story entitled Exeunt (A Film) for their comeback issue.